snowdeal.org > ex machina: the eric update - day 395: odin learns to share! the eric update - day 395: odin learns to share! a mere week after odin has his first adventure with cheerios, i was astonished to watch him take a moment during his breakfast routine to share (!) with mauja! before this week, odin hasn't really had that much opportunity to actively share his food since he's been only eating pureed baby food, leaving only the occasional opportunity for the dog to lick a few bits off his hands or face; mauja is very excited to discover odin's new interest in sharing, but even in his excitement he's ever so very careful to gingerly remove each cheerios from odin's hand. 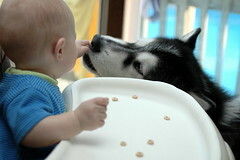 odin likes the sharing game as much as mauja does and i'm quite sure that mealtime will never be quite the same again. 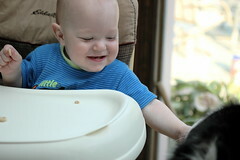 I love seeing the photos of Mauja interacting with Odin! He seems like a wonderful dog--so gentle and patient. Is this the result of training on your part, a natural characteristic of Huskies, or just his unique personality? anonymous: "Is this the result of training on your part, a natural characteristic of Huskies, or just his unique personality?" in any case, they're great animals around kids, but it should never be forgotten that they have a very strong prey drive. as far as training goes. 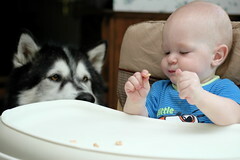 any malamute owner will quietly laugh to themselves at the thought. they're notorious for being impervious to training.